Spirit Airlines on October 4, 2018 celebrated its first day of international service out of Orlando International Airport (MCO) by announcing it will bring hundreds of new jobs to the Orlando area with a new crew base for Flight Attendants and Pilots. The crew base will open on December 1, 2018 and will start with nearly 150 crewmembers. This move will help support Spirit’s massive international expansion in Orlando, adding to the 150 airport services jobs recently created to support the growth. Spirit is expected to bring hundreds of more inflight positions to Orlando this spring with job fairs expected in the coming months. Spirit begins new Orlando service today to Aguadilla, Puerto Rico (BQN); Guatemala City, Guatemala (GUA); Panama City, Panama (PTY); and Santo Domingo, Dominican Republic (SDQ). The inaugural flights kick off a flurry of new international and domestic routes from MCO starting in the next two months. The new routes increase Spirit’s offering to the Orlando region, with nonstop service to 38 destinations and up to 49 daily flights across the U.S., the Caribbean and Latin America. This latest announcement follows the addition of new service to Asheville and Greensboro, NC last month. It also comes as Spirit begins its fleet-wide Wi-Fi installation in Orlando. Spirit’s state-of-the-art, high-speed Wi-Fi connectivity will roll out through 2019, providing Guests the ability to watch, stream, surf and text in flight. 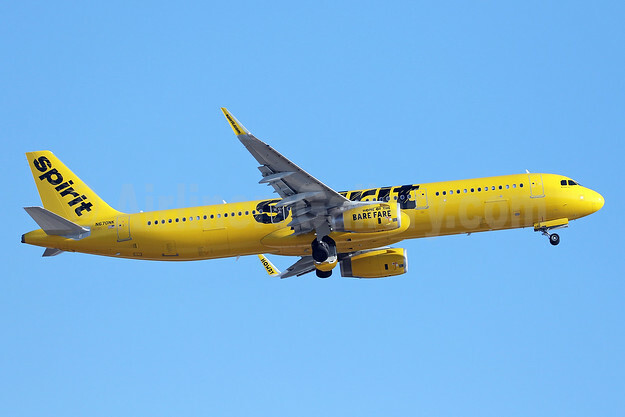 Top Copyright Photo (all others by Spirit): Spirit Airlines Airbus A321-231 WL N670NK (msn 7106) BWI (Ron Monroe). Image: 943770. This entry was posted in Spirit Airlines and tagged Airbus A321-231 WL, msn 7106, N670NK, Spirit Airlines on October 5, 2018 by Bruce Drum.